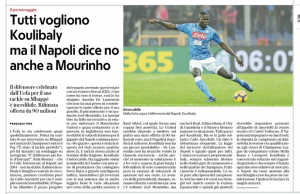 ‘Everyone wants Koulibaly but Napoli also says no to Mourinho’ – Sunday’s Naples regional edition of La Repubblica goes with a headline underlining interest in Kalidou Koulibaly, and also Napoli’s stance against a sale. The Italian media use ‘maxi offer’ to describe a huge bid, rather than a club’s maximum offer. Jose Mourinho is presented as being ‘most insistent’. In the report it’s repeated constantly that Napoli have no intention of selling the defender and are confident in their ability to knock back all comers. 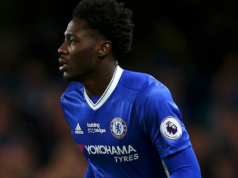 It’s claimed that ‘a few months ago’, presumably in the summer transfer window, English clubs, and Manchester United specifically, were told ‘No Grazie’ when they approached about a transfer. Despite all the insistence over the player not being for sale, La Repubblica do state his actual transfer value is over €100m. By coincidence, Corriere dello Sport also have an article on the player today, and they reference interest from Mourinho’s side, Manchester City, Barcelona, Real Madrid, PSG and Bayern Munich. And the value they put on a potential transfer? Again it’s stated to be €100m+. Maybe this is the price that Napoli are trying to distribute around Europe, so that clubs know they’ll have to completely smash the record for a defender transfer, currently held by Liverpool for Virgil van Dijk.